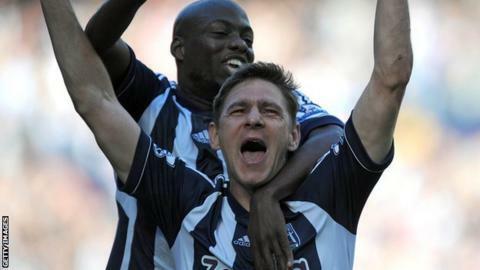 West Brom continued their fine start to the season as they overcame QPR to add to the pressure on Mark Hughes. Rangers boss Hughes has received owner Tony Fernandes' backing but the league's bottom side were behind early. James Morrison headed in after five minutes before Zoltan Gera capitalised on Anton Ferdinand's error for 2-0. Adel Taarabt's brilliant volley reduced the deficit but Youssouf Mulumbu swept in late on and Esteban Granero's fine strike was only a consolation for QPR. The Spaniard's exquisite goal was followed seconds later by a glorious chance to equalise for Jose Bosingwa, but the defender blazed over from close range. Despite their strong finish, QPR failed to learn from the chastening experience of their previous game, when they afforded West Ham far too much time and space in midfield and were duly punished. Perhaps the selection of Granero in place of Alejandro Faurlin was an acknowledgement of that problem by Hughes, but the former Real Madrid midfielder - excellent going forward throughout - is hardly the destructive presence they are lacking. West Brom have been one of the standout teams so far this season - they have now recorded their best start to a top-flight campaign in 93 years - and they did not need the encouragement afforded them by the visitors. The Baggies' start was explosive, capitalising on QPR's defensive vulnerability and an obvious lack of confidence after five minutes as Morrison headed home Shane Long's cross to finish off a lightning counter-attack. Maybe that was only to be expected, since QPR have a dismal away record following their return to the Premier League, taking only three points from a possible 48 before this match. Indeed, Hughes has yet to win a league game on the road since taking charge at Loftus Road. And there was an air of resignation about Rangers, even before they fell 2-0 behind. Gera had already had several sights of goal and he was lurking as Anton Ferdinand made a mess of dealing with a right-wing cross. As the ball fell to the Hungarian, he steadied himself and slotted calmly beyond QPR keeper Julio Cesar from 12 yards. But for all their early struggles, Hughes will have been encouraged by his side's response. Taarabt, the architect of their promotion to the Premier League two seasons ago but a peripheral figure since then, produced a moment of magic to drag Rangers back into contention. He collected Granero's clever chipped pass 10 minutes before the break, controlled the ball on his chest and rifled a fierce volley beyond Ben Foster from just inside the penalty area. QPR's squad boasts an eclectic mix of players following Hughes's summer signing spree but there is no doubting they possess the talent to trouble Premier League opponents. And with the confidence provided by the goal, they began to look more of a force, with Taarabt at the heart of much of their best play. He and Shaun Wright-Phillips both went close after the break, as did Granero, but their finishing left much to be desired. That wastefulness was punished when the fluency that deserted West Brom during the middle of the game returned to stunning effect with five minutes left, Mulumbu capitalising on Gonzalo Jara's precise pass at the end of a sweeping team move. There was still time for Granero to curl in a sumptuous second for QPR and Bosingwa to waste arguably the day's easiest opportunity, ensuring Rangers remain bottom and West Brom move up to fourth. West Brom manager Steve Clarke: "Defensively we weren't at our best but I'm happy. We moved the ball well and looked good going forward. Both teams went out there to win it. There were a few mistakes and some casual play in possession, but we had some good moves and the quality of the goals were top class." QPR manager Mark Hughes:"In the early part of the game we gave ourselves too much to do. We talk about the fundamentals of defending and we didn't do that. We didn't start correctly. We were slow and not dynamic. They produced two good balls and we didn't deal with them. "If you go 2-0 down away from home it's nigh-on impossible to get back into it. For the vast majority of the game I thought we were in control, but we need to take the defensive errors out of our game."